I’m not fond of winter, it’s cold with short days. But it is completely redeemed by being the season of brussels sprouts. I know some people hate them, but they REALLY are great fried or roasted. This time I pan-fried them in a little olive oil with garlic and chopped dry roasted almonds. A lovely combination of flavours and texture. This works as a vegetable side dish or with some pasta. I ate it with some pasta and a sprinkling of Vegusto Piquant cheese. I didn’t photograph it before I scoffed it down. Prepare the sprouts by removing the bottoms and any ratty looking outer leaves. Slice them vertically into 3mm slices. 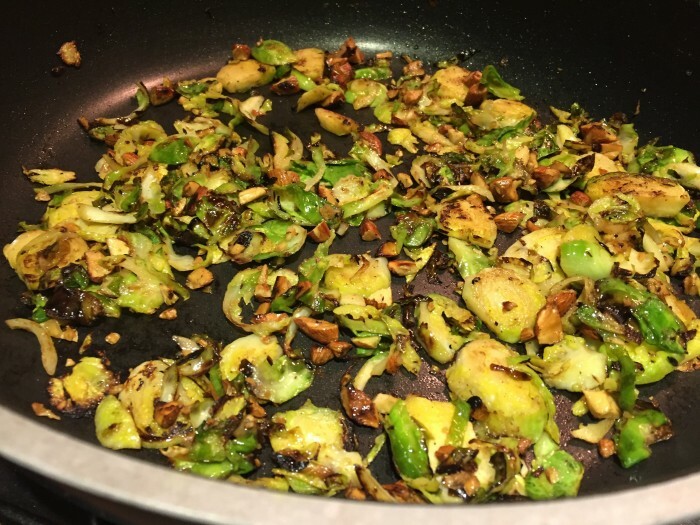 Heat the oil and fry the sprouts over a medium heat until they start to blacken and are tender. Add the garlic and fry for 30 secs. If the sprouts are still not tender put a tablespoon or two of water into the pan and cook until the water evaporates. Add the chopped almonds and toss to combine. Serve as a dish on its own or with pasta.